Springen O'Flaherty has the ability to see auras. As a child she lived in a Popsicle world where the kids were swathed in brilliant colors and the grown-ups were a fuzzy pastel. Later, her psychic powers multiplied and resulted in a life of secrets and half-truths—of otherworldly sights and experiences. Spring was resigned to the status quo until she met Jed Collinsworth. Now she wants that two-kids and a minivan life, but to accomplish her goal she has to be honest with the man she loves. But first she has to come to terms with her unique abilities. The sudden loss of her dad plays havoc with Spring's well-laid plans. Ready or not, Jed is about to be introduced to the O'Flaherty clan of western Virginia with all their eccentricities and quirks—tent revival preachers, gospel musicians, healers, heroes, and pot growers. When faced with the truth will Jed help Spring discover the elusive sense of peace and acceptance that she's always wanted? And will she finally restore her relationship with God? 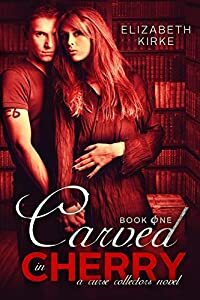 One thing set Lydia Shaw and her store apart from the other antique shops in town… Lydia’s collection was plagued by curses, and it was her duty to break them. Rachel, Angie, and Jo knew nothing about their aunt’s secret life. In fact, they didn’t even know she owned an antique shop, until they inherited it. Unfortunately for them, Lydia passed down more than just her store. The sisters are the proud new owners of countless deadly curses, buried under centuries of dust. Lydia also left behind her apprentice, Peter. He does everything he can to protect the girls, as they explore their new store, unaware of the dangers it hides. In spite of his efforts, Rachel finds herself obsessed with opening a strange trunk, Angie has vivid dreams, haunted by a man who claims he needs her help, and Jo’s imagination starts to run wild. When one of them falls victim to a curse, it’s up to Peter and her sisters to save her. But, if Peter can’t teach them to wield a magic, that he barely understands himself, she’ll be the first one to die. …but the solution is unbelievable. Moving to Wales was a chance at a new start, a quest for somewhere to belong. Things don’t always go as planned. First it was the dreams. Why was she drawn to the forest? And who are the strange beings with glowing cat-like eyes? Can one kiss magically change her life? Can she become the peacemaker she was meant to be? 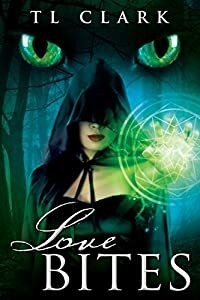 You’ll love this paranormal romance because everyone loves a story of triumph with witches, faeries and dragons. 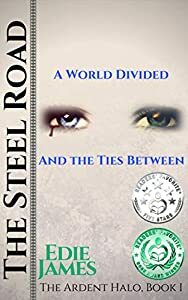 Awarded Honorary Mention of the 2018 Reader's Favorite contest in the "Magic/Wizardry" genre and given five stars by Readers' Favorite, The Steel Road has been referred to as "a beautifully depicted adventure fantasy" and "a complex coming of age tale ripe with politics, agendas, deception, and magic". Sundered for a reason, the world is two-sided. But mankind defied the sanctions, conjuring a passage from the Old World through the equatorial ring of flames and inhabiting the elven hemisphere. As this invasive species disseminates, conflict ensues, centuries pass, and an industrial revolution begins. Now, reparations must be made. A human-elf hybrid is murdered to spark a cleansing fire but is denied passage to the heavens. Instead, Dreyah is reborn headstrong and impetuous but more so than any other teenager, is uncertain about her place in the world. 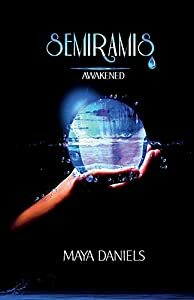 Seeking revenge for her murder, Dreyah traverses Udia, a realm that was devastated by an old war between her two peoples, and the circumstances highlight her greatest dilemma; she must choose a side in the coming days. Years ago, Cambria’s king gave Kennason to a foreign prince as a gesture of peace between their two realms. But after the death of her second husband and a marriage of mutual distaste, Kennason abandons the Andanes and returns to her homeland where magic is not tolerated but steam and pistons charm the masses. 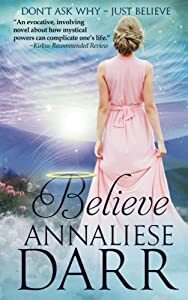 Reunited with family and in the solace of an emerging romance, she grasps contentment, but when she is abducted by renegade wizards, painful family secrets reveal there was more to Kennason’s banishment than a simple gift. When Old World monsters begin menacing Cambria, this exiled queen and murdered teen find their parallel tracks are bound together by history, prejudice, betrayal, and blood as they race to uncover old truths in the first installment of The Ardent Halo story.